I grew up by the ocean, spending my earliest years on the beaches of South Texas before moving with my family to the tiny island of Okinawa where I spent my grade school years. I remember late nights at shacks in Texas, seasoned and boiled crabs dumped from enormous buckets onto newspaper-lined tables. It’s there that, before kindergarten, I learned to smash my way through bright red, wild-armed creatures and pluck out every bit of their juicy, sweet flesh. Later, in Japan, I remember pacing through the markets with my mother and younger sister. Alongside pots of fermented vegetables, strange herbs, and bags of rice, I remember the freshly caught fish: their eyes still glassy from the sea. And while I live miles and miles from the ocean now, I still miss fish. Its clean flavor. Its feel-good fats, vitamins and minerals. Fortunately now, sustainable, wild-caught fish can be shipped straight from the producers to my doorstep, so I lean upon organizations like the Seafood Producers Cooperative who recently sent me a tidy little package of gorgeous albacore medallions and albacore tuna in BPA-free cans to develop recipes with. While much of my family’s foods come from close to home, I make exceptions for those foods that I feel are worth the distance. Those foods that are profoundly nourishing, or that are, quite simply, delicious and that cannot be had locally. Olive oil, to be sure. Coconut oil and unrefined cane sugar, from time to time. And fish, lots of fish. Deeply, and profoundly nourishing, fish is a food that supports wellness in a way few other foods can match. It is rich in protein, B vitamins, minerals like selenium, phosphorus, magnesium and potassium. Most importantly, fish typically offers a favorable ratio of omega-3 to omega-6 fatty acids which supports cardiovascular, emotional and cognitive health. Fish was so profoundly critical to health, that even preindustrial, landlocked peoples went to great lengths to acquire and preserve fish and seafood, often reserving them as a sacred food for women of reproductive age and small children (read more in Nutrition and Physical Degeneration). It’s important, folks. And while concerns over mercury levels and oceanic pollution abound, the truth of the matter is that eating fish is far safer than not eating at all (read it here, here and here). Of course, while it’s important to eat fish, it’s also vitally important to choose the right kind of fish: fish that is nourishing, fish that is from healthy and sustainable stocks. That’s why, before I make a purchase, I typically visit Seafood Watch (a service of the Monterey Bay Aquarium) that rates fish as “Best Choice,” “Good Alternative,” or “Avoid” based upon factors related to environmental impact, such as if the stocks are well-managed, and if they’re caught or farmed in environmentally sustainable ways. How fish are caught, for example, plays a critical role in the impact of marine ecology. Further, it plays a role in the flavor and quality of the fish on the plate. When fish are caught by hook and line, one fish at a time, bycatch is minimized. 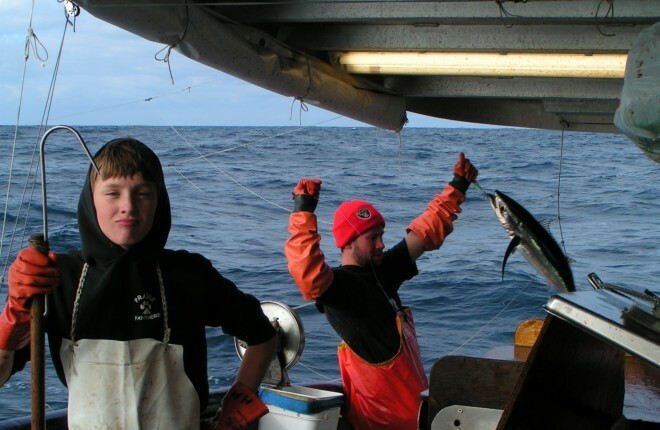 Further, catching fish one at a time also ensures optimal flavor as each fish is handled with care and attention unlike fish caught by net which are often already dead by the time they land on the boat, and are sorted in bulk on the deck. Further, when you catch fish with intention at peak season when the fish are particularly well-nourished, the fish are meatier, and are likewise richer in nourishment. The Seafood Producers Cooperative, a fishermen-owned group that sells their fish to some of the finest restaurants worldwide as well as online here, is committed to selling only hook-and-line caught fish, exemplifying what it means to take pride in the work of supporting families, honoring marine ecology through sustainable fishing practices, and maintaining the best quality fish for the marketplace. 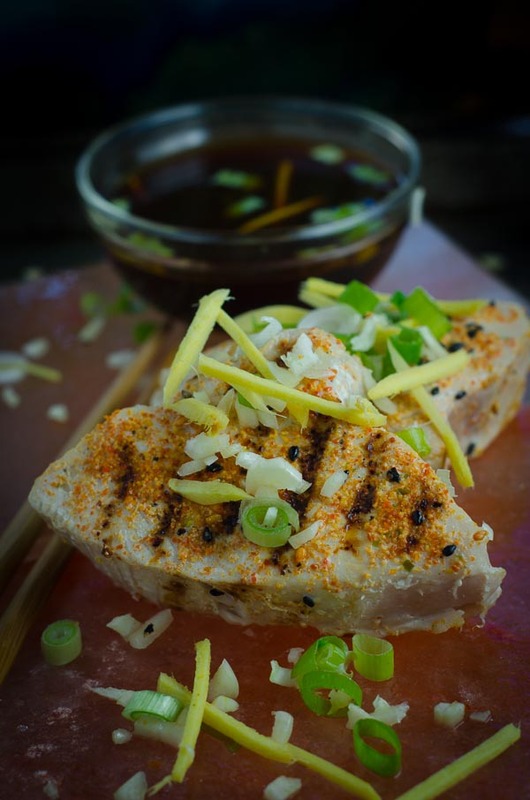 Like I mentioned earlier, I’ve been working with the Seafood Producers Cooperative, which is the oldest fishermen’s cooperative in North America, to develop recipes (and I’m SO excited to share one of my favorites with you: Seared Albacore with Ginger, Garlic and Green Onions, recipe below) and I have another coming that uses their canned albacore tuna. They’re a cooperative of fishermen who fish for wild-caught salmon, halibut, sablefish and albacore tuna. These are small family fishermen, fishing in clean waters using sustainable methods, and you can learn more about the fishermen here and in this video here. By working together, with commitment to common values and to care in their profession, they are able to bond together to make their fish available directly to the public. And you can order fish straight from the cooperative here, with free shipping no less. So with albacore medallions sent to my door, I started the pleasant task of preparing them. Wild-caught albacore is an extraordinary fish: tender and light, with a creamy finish and mild flavor. For these reasons, albacore is best served raw (or nearly raw) which not only helps it retain its nutrients better, but it also preserves its delicacy. Calling to the roots of my childhood which were steeped in Okinawan fish markets, I pair Seafood Producers Cooperative albacore medallions from the AlaskaGoldBrand.com website with the sharp, salt notes of naturally fermented soy sauce as well as the peppery, floral heat of fresh ginger as well as garlic and green onions. It’s lovely. We serve it with steamed rice, and a side of my homemade kimchi or pickled daikon radish. Light and mild with a clean, clear flavor and a firm but yielding flesh, albacore pairs well with strong flavors like soy, citrus, ginger and garlic in one of my favorite dishes. As a mild, light fish with little fat of its own, take care not to overcook the albacore so that it remains wonderfully tender. Set the albacore medallions on a plate a sprinkle them with half the salt and nanami togarashi, then flip them over and sprinkle the reverse side with the remaining seasonings. Sear the seasoned albacore in the preheated grill pan, about 1 minute on the top and bottom sides. Remove from the pan, and plate. Whisk soy sauce, lime juice and honey together, and pour into a small dipping bowl. Arrange scallions, garlic and ginger over the seared fish. To serve, pluck up a piece of fish and garnishes and dip into the soy-lime sauce. If you do not have nanami togarashi, substitute ½ teaspoon black sesame seeds, ½ teaspoon crushed red pepper flakes, and 1 teaspoon finely grated orange zest. Photo Credit: Images, with the exception of the photo of the seared albacore medallions, are provided by Seafood Producers Cooperative. he barely cooks his like you. Any suggestions? My favorite place to get fish! I’ve got their albacore out for Friday date-night dinner–I’ll try this gorgeous looking recipe. Thanks!!! Looks like an awesome recipe, Jenny! I just have to pick up some togarashi spice. 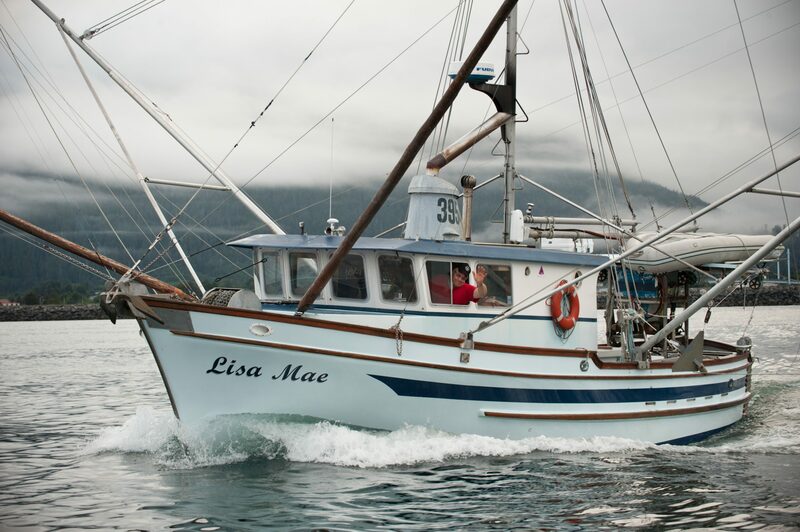 We get our fish from a Community-Supported Fishery called Skipper Otto’s CSF, which also supports family fishermen. 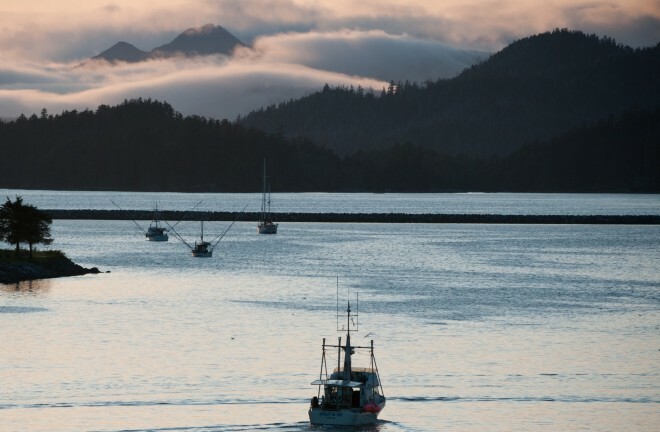 They offer sustainably-caught salmon, halibut, and tuna from the west coast of B.C. and drive out to those of who are land-locked (I’m in Calgary, AB) a couple times a year to deliver flash frozen-at-sea seafood. I’m so glad you included a substitute for the spice mixture since seaweed and I don’t get along. What could be used instead of the soy sauce? Soy ANYTHING makes me stop breathing, and I’m strangely fond of breathing. This looks like a great recipe and I’d love to try it. But tuna is the only thing my husband is deathly allergic to. Will it work as well with any other type fish?